Own The Sarah Jane Adventures - Invasion Of The Bane DVD from Deff, DVD, Blu-Ray & 4K Video Specialists - Free UK Delivery..
Own The Sarah Jane Adventures Series 1 to 5 Complete Collection DVD from Deff, DVD, Blu-Ray & 4K Video Specialists - Free UK Delivery..
Own The Sarah Jane Adventures Series 1 DVD from Deff, DVD, Blu-Ray & 4K Video Specialists - Free UK Delivery.. 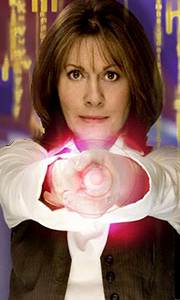 Returning in this gripping second series alongside her son Luke, new girl Rani and Clyde, Sarah Jane once again battles to save the Earth. What is the connection between the sinister clown and the missing children? Can Sarah Jane confront her oldest fear and why is her former enemy asking for help? Join Sarah Jane and her companions as they unlock the mysteries in these twelve thrilling episodes.This boxset features the following stor..
A return to 13 Bannerman Road finds Sarah Jane, along with her son Luke, and teenagers Rani and Clyde, with more earth-visiting aliens to investigate. These exciting new adventures include the return of their most fearsome enemy yet - the Judoon; a lonely telepathic alien whose powers grow out of control; unexplained phenomena in a haunted house; a painting that comes to life and a pair of Slitheen- Blathereen attempting to overrun Eart..
Having faced a chilling figure stalking their dreams, Luke leaves Sarah Jane and the gang as he departs for university with K9. But the planet won't save itself and there are still more adventures to endure: confronting the Men in Black at the Vault of Secrets; waking to find they are the only survivors of the human race; battling in different time zones against ghosthunters, Nazis and Tudors; and attending the Doctor's funeral where th..
With special appearances from The Eleventh Doctor and former Doctors companion Jo Grant. Having faced a chilling figure stalking their dreams, Luke leaves Sarah Jane and the gang as he departs for university with K9. But the planet won't save itself and there are still more adventures to endure: confronting the Men in Black at the Vault of Secrets; waking to find they are the only survivors of the human race; battling in different time .. Investigative journalist Sarah Jane Smith and her young sidekicks are back in the final ever episodes of The Sarah Jane Adventures. The gang soon find themselves up to their necks in alien trouble: discovering an explosive foundling baby; getting drawn into the middle of a war between Fleshkind and Metalkind; being divided by a curse delivered through an ancient totem-pole; coming face-to-face with alien light sculptors, the one-eyed Sk..